This weekend’s La Prevoyante sees Dalvina back in action for her second US start; she’ll be facing some competition from PA-bred Redaspen (only off the board four times in 23 lifetime starts) and the Chilean-bred Eres Magica, who seemed to snap back into her previous good South American-form in her most recent race (setting a track record in the process) after a few lackluster starts in the US. 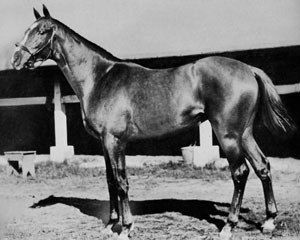 But Dalvina should not be ruled out despite the high weight and potential competition; she was a leading contender for the Cartier award for 3-year-old filly that went to the outstanding Peeping Fawn. The French-bred Green Girl is also one to watch if it’s wet; she’s a fan of soft turf. If the going stays firm, we should see Revved Up in his final performance of the season in the McKnight and it seems there is every chance he’ll return to race again next year as a 10-year-old — although he’s often overlooked, Revved Up has won 13 stakes races over the past 7 years, on dirt and turf. Soldier’s Dancer is back for another crack at Revved Up as well — but again, any rain suggests that Revved Up will sit this one out. In a rather complicated turn of events, Darley Japan has lost their license from the Japan Racing Association for the time being, although apparently this will not affect their breeding operations in that country where they stand such stallions as Admire Moon. The trouble is over the number of foreign owners allowed; Darley’s Japanese point person retired and that seems to have thrown things into confusion. Finally, Toussaud has been pensioned due to laminitis; while I think some of her offspring were wildly over-rated (and were rumored to have inherited her peculiar brand of crazy), she’s definitely been a top producer; here’s hoping she is able to have a comfortable retirement.